You are here: Home / Family / Happy Thanksgiving! Happy Thanksgiving! Hope you are enjoying the holiday with family and friends. Our day is full of family time. We are blessed to be able to get to share the day with both of our families. As in year’s past, we will start the day at lunchtime with Bob’s family. It is a serious event, and we always have Thanksgiving Trivia first. My brother-in-law creates the trivia each year, and it is very competitive because of the prizes! The prizes are treasured items like wine or lottery tickets. Nonetheless, it is always fun! As you can see, Amy and I were very serious about our trivia quiz last year. 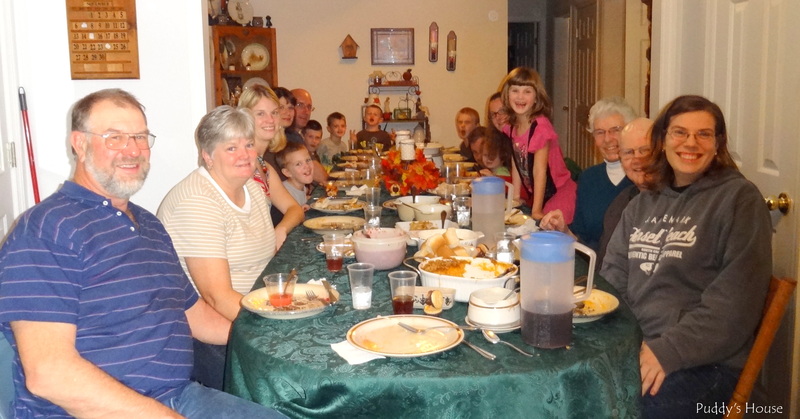 After trivia, we gather around the table and share in the delicious Thanksgiving meal. And, before we can depart for the day, we play a game of hoops. Again, it is a serious game like H-O-R-S-E, or sometimes S-H-I-T because of a lack of time. I’m pretty terrible at basketball, which you maybe able to tell from my poor form shown above. It is still fun though. Some shots are crazy ones like one eye closed, tongue sticking out, and standing on one leg. But, at least it burns off a little bit of the turkey dinner. 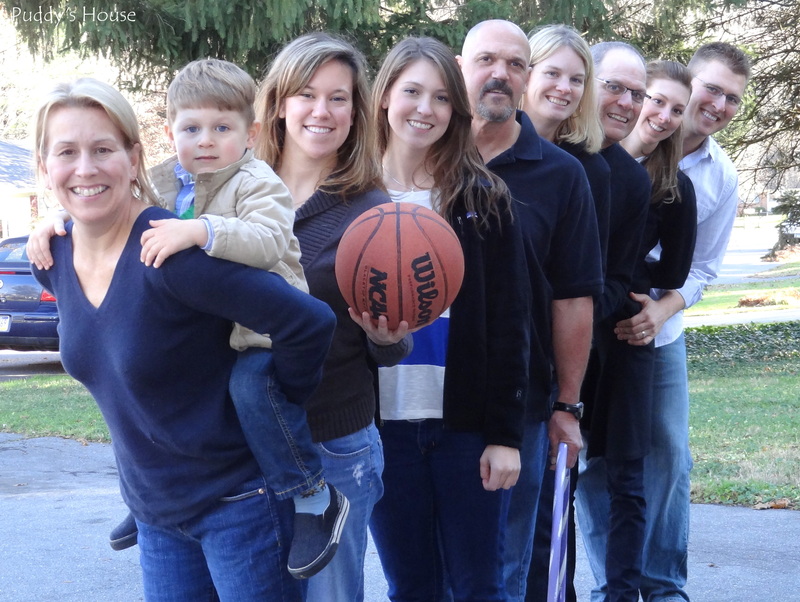 Before we end the celebrating with Bob’s family, we have made a tradition of our post-basketball line-up picture. Looks like it must have been a nice day last year, as we are not all bundled up and freezing. Today is predicted to be another beautiful day for our Thanksgiving basketball! After just a few hours with Bob’s family, we return to our house, pick up Puddy and start the drive to my parent’s home. Crazy as it is, we take two cars. So, Puddy gets to ride with me on the way, because he ends up returning home with Bob at the end of the evening. I stay with my family so that we can continue our tradition of Black Friday shopping. The tables at my family are full of people and food! My Mom thought ahead when she designed her floor plan in this house. Her kitchen and dining room are connected with a large open doorway. This design specifically helps to accommodate our family on holidays. We connect the kitchen table to the dining room table for one long table so that we can all sit and share the day together. This year should look very much the same, my parents, siblings and their spouses, nieces and nephews, and my grandmother and her husband. My younger sister got married this year, but her husband is currently in Georgia for his National Guard training. We will miss having him here with us to share his first Thanksgiving as a member of our family, but he will definitely be in our thoughts and prayers, and fortunately he will be returning home to my sister next week. What are your Thanksgiving Day traditions? Anyone else have trivia or basketball? Or, what about some serious Black Friday shopping planning? Whatever your Thanksgiving traditions, I hope that are able to enjoy the day and remember all the reasons we have to be thankful.